Face-lifted 5th generation Toyota 4runner owners, The 4runner has always been one of my favorite’s from Toyota. Its tried & true on & off road reputation speaks for itself, & has since its first model was released in 1984. Fast forward to the face-lifted 5th generation 4runner. “ The most capable 4runner yet “, So what better way to compliment its off road capabilities, other then by adding a winch to its arsenal of off road goodies. But not with some Big bulky,heavy, expensive(well over $1000 dollars). And no, not with some universal erecter set bolted to your wimpy aluminum so called bumper. This one is just right. Hidden Winch Mount Specialist proudly presents the face-lifted 5th generation 4runner hidden winch mount. Constructed of 3/16” structural grade steel. Welded & gusseted @ all of the crucial tie in points. Its simple, you replace the factory bumper with the undercoverhwms & your winch & fairlead of choice. The undercoverHWMS ties into your 4runners frame using 4 different frame locations. So, no worries when winching any direction. This winch mount isn’t going anywhere. Minimal trimming of the factory bumper cover is required. Solenoid Bracket is NOT included with this product and the use of a wireless remote style winch is recommended. Otherwise, it’s up to you to relocate the solenoid pack so that it is accessible for winch remote control. 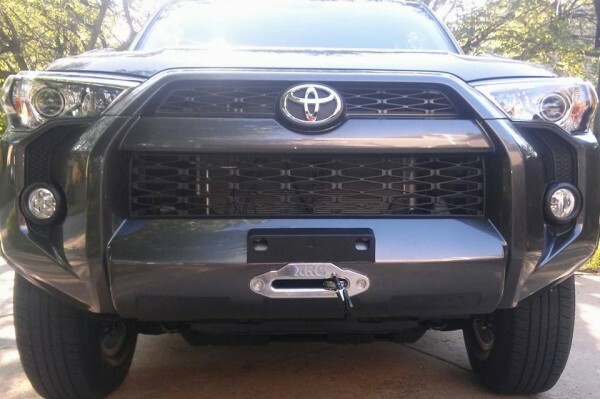 By purchasing the Hidden Winch Mount Specialist you the purchaser are soley responsible for replacing the vehicles factory bumper/crush zone. For off road use only.